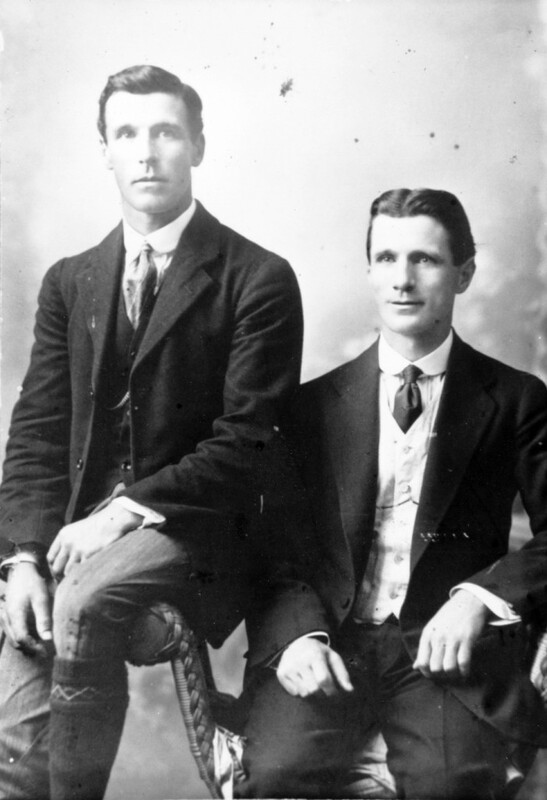 Studio portrait of Jack Dunn, right, and his brother, Matthew Dunn junior. John Robert (Jack), born 1888 and Matthew junior, born 1885, were sons of Matthew and Sarah Dunn, Scottish immigrants who occupied ‘Willow Bank’ at Whakataki for many years. There were four other children, attending Whakataki School. By 1914 Matthew was a labourer at Martinborough and Jack was a journalist with Wairarapa Daily-Times newspaper in Masterton. The Dunn brothers enlisted at the first call for volunteers for the NZEF in August 1914. Jack went to the Wellington Battalion (service number 10/594) and Matthew initially joined the Wellington Mounted Rifles (11/247). They both embarked with the Main Body in October and spent time in Egyptian camps until the Gallipoli Campaign. Jack took part in the landing on 25 April 1915 with the Wellingtons. He had several bouts of pneumonia, being hospitalised in May and June. On 18 July he was found asleep at his sentry post, a serious military offence. This resulted in a court martial, at which Jack was sentenced to death. The sentence was confirmed but on 30 July ‘remitted’ by Sir Ian Hamilton, commander of the Mediterranean Expeditionary Force. A week later the August Offensive opened and Jack, along with the Wellington Battalion, took part in the assault on Chunuk Bair on the morning of 8 August. He was one of many battalion members missing by the time the survivors came off the hill. A board of enquiry in December 1915 concluded he was killed in action. Jack has no known grave and is commemorated on the Chunuk Bair (New Zealand) Memorial on the hill’s summit. Matthew arrived on Gallipoli in May 1915, when the Mounted Rifles, as infantry, joined the battle. He also suffered health problems, with a spell in hospital on Lemnos Island in June and again in September, with influenza. In October he again left Gallipoli, this time for Hornchurch Hospital in England. In March 1916 he was posted to the NZ Field Artillery in Egypt. After receiving a shrapnel wound in the hand he spent time at Aotea Hospital near Cairo. He returned to England and from Codford Camp was invalided from active service in November 1916. Matthew sailed back to New Zealand to be discharged from the NZEF on 22 January 1917. This was not the end of Matthew’s military life however. In 1918 he served as a machine gun instructor at Featherston Camp with the rank of sergeant-major. Matthew also saw home service in New Zealand during World War Two. He died in 1946.